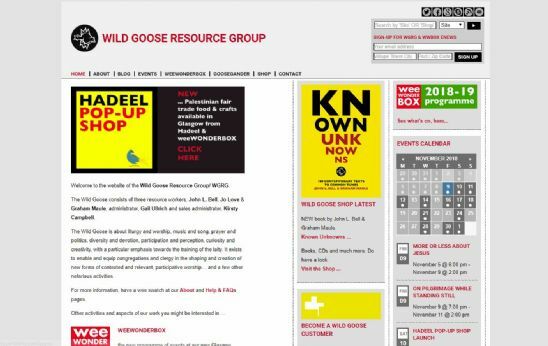 Based in Glasgow, The Wild Goose Resource Group (WGRG) is a semi-autonomous project of the Iona Community. The Wild Goose is about liturgy and worship, music and song, prayer and politics, diversity and devotion, participation and perception, curiosity and creativity, with a particular emphasis towards the training of the laity.ÊTheir Resource Workers are active throughout Britain and abroad, in local congregations, churches, schools, colleges, universities, at festivals, denominational conferences, training events and with voluntary organisations concerned with both social & international justice and creative possibility. They take part in workshops, evenings of song, services of worship and more. Head over to the website to find out more about what they do and events they're involved in including their weeWONDERBOX face to face events. The website also has a shop which includes books, CDs, badges and Christmas cards. Would you like a .scot domain for your website/email? Register your .scot domain nameÊwith Calico now?